We all wish light bulbs could burn forever, but in reality, incandescent bulbs have a lifespan of around 900 hours. 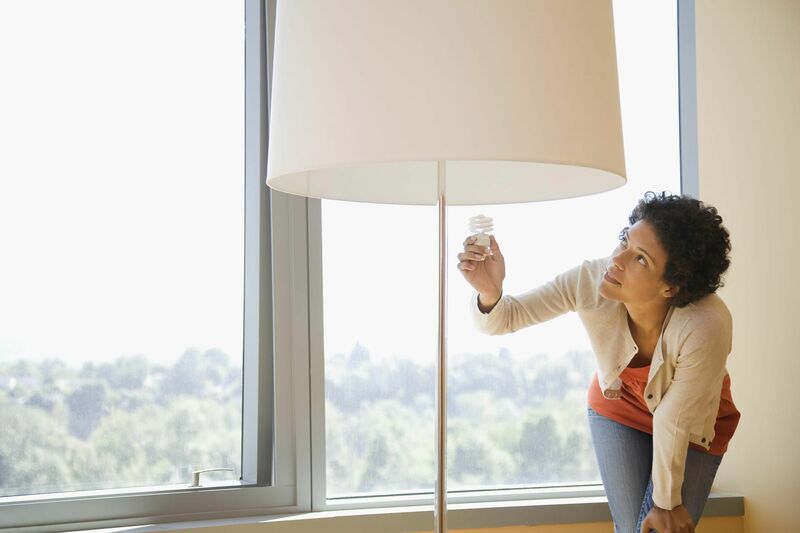 Based on a usage of eight hours a day, a bulb should last roughly about four months. Compact fluorescent bulbs are supposed to last much longer, but this is not always the case. If you have replaced bulbs recently and the lifespan doesn't seem to be all that it should, the cause may be the fixture itself or other potential problems. If the supply voltage to your home is too great, bulbs will generally burn brighter and burn out much faster. You can test for voltage at a standard (120-volt) electrical outlet, using a multimeter or a voltage tester; be sure you know how to do this safely because the power will be on. If a test reveals a voltage higher than 125 volts, have an electrician take a look at the problem, or contact your electric utility provider for recommendations. Another cause of bulbs burning out is excessive fixture vibration. A good example of this is a ceiling fan with a light fixture. When a fan blade becomes unbalanced, the fan starts to shake. This vibration jiggles the filament in the bulb and will lead to shorter bulb life. The same problem is common with light bulbs in garage door openers. You can try a rough service bulb to correct this problem. These bulbs have heavy-duty filaments to withstand vibration better. The little metal tab at the bottom of a light bulb socket is the "hot" connection that delivers electrical current to the bulb. If the socket gets pushed down too far, it can fail to make contact with the bulb. To remedy this, unplug the lamp or turn off the power to the fixture, then use a wooden popsicle stick to bend the tab up about 1/8 inch. Compact fluorescent (CFL) bulbs are notorious for going bad before their time. CLFs are commonly touted to have a long lifespan of about 10,000 hours, but if you've owned some of these, you probably know that this number is grossly exaggerated in many cases. The answer: switch to LED bulbs. They're more efficient, they last longer, and they don't contain mercury like CFL bulbs do. When a bulb is loose in the socket, it can flicker on and off. Simply tighten the bulb to correct the problem. Another issue may be a loose wire connection. Turn off the power and check the connection on the fixture. Contacts in the center of the socket can get worn or corroded and cause you a lot of headaches. In this case, replace the socket or the fixture. If the circuit isn't working due to a tripped breaker or blown a fuse, there may be a short in the circuit. The fixture cord may be shorted, a plug could be defective, or the light socket may be shorted or defective. In any of these cases, replace the defective parts before resetting the breaker or replacing a fuse. Most light fixtures have a label stating the maximum bulb wattage to use in the fixture. Open the fixture globe or cover and check to see if the bulb wattage is too large for the fixture. Using a bulb with a wattage that exceeds the maximum rating creates excessive heat, reducing the bulb life and potentially melting the insulation on the fixture wiring. Prevent problems by using the appropriate bulb wattage. Energy-efficient bulbs (such as LEDs) have much lower wattages than standard incandescent bulbs while producing an equivalent amount of light. Recessed light fixtures often have housings that extend into the attic. Some fixtures are designed to be covered with attic insulation, but some fixtures must have the insulation held back by at least 3 inches, to prevent overheating of the fixture. Overheating can cause bulbs to flicker or burn out early and can potentially lead to a fire. If your fixture is not rated "IC," it should not be covered with insulation. You can build a box around the fixture housing to allow for the appropriate space.